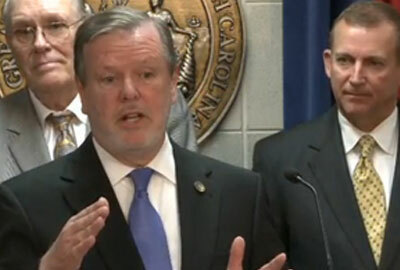 North Carolina Senate leader Phil Berger (R-Rockingham) released the details of his 2014 education budget yesterday, which would provide teachers with an average 11 percent increase in pay beginning this fall. But there is a catch — those who would like to take home the significant pay raise, which amounts to somewhere between $5,000 and $6,000 for many teachers, will have to give up their career status, also known as tenure. Lawmakers have been trying to squash tenure for some time, and the General Assembly repealed it during last year’s legislative session. Beginning teachers who are in their first three years of service would see pay increases of around seven percent, then bigger jumps would come for those who have more years of experience. Teachers who are in their seventh year of experience, for example, would see a pay increase of $5,330, or 17 percent. The salary increases begin to level off after the 20th year of service. Any teacher who wants to get on the new salary schedule must give up their tenure rights. Otherwise, they can stay on the old schedule – but Senator Berger warned they’d never see a pay raise again if they make that choice. North Carolina Association of Educators (NCAE) President Rodney Ellis was frustrated yesterday with the Senate’s approach to teacher pay raises. “If they think it’s a priority to give all teachers an 11 percent pay raise, why don’t they just give the pay raise? Why tie it to taking away a constitutionally protected right?” said Ellis. The Senate’s plan seems to acknowledge that teachers have suffered under years of a frozen salary schedule, even though some lawmakers have suggested that teachers should be grateful for what they have and their salary and benefits packages are reasonable. The budget proposal stands in stark contrast to that of Gov. Pat McCrory’s, which offers large pay increases to beginning teachers, a two percent average raises to everyone else, and a future plan to move to a new salary schedule, but that would have to be acted upon down the road. McCrory also offers more plans in his budget proposal to tie teacher compensation to performance in the classroom, an idea typically lauded by GOP lawmakers but not seen to the same degree in the Senate plan. For the state’s 95,000+ teachers who haven’t seen a significant pay raise in at least six years, an eleven percent jump in pay is tempting for many. Marc, a teacher from Advance, NC, told N.C. Policy Watch he feels lawmakers have teachers over a barrel when it comes to the tying pay raises with tenure. Last year, lawmakers moved to eliminate career status for teachers completely by 2018 – an action necessary, said Berger, because it was too hard to get rid of bad teachers. For the next four years in the run up to tenure’s elimination, local school districts were required to offer temporary, 4-year contracts to the top 25 percent of teachers in exchange for giving up their due process rights early. The contracts came with a promise of small pay increases of $500 annually, provided that the legislature moved to adequately fund the plan each year. Teachers were outraged by the lawmakers’ move to kill off tenure. With tenure protection, teachers get a hearing by a specially trained officer, often an ex-judge, in the event of demotion or dismissal. Charlotte attorney John Gresham, who has devoted most of his career to representing public school employees, says this kind of job protection is especially important for teachers who must deal with members of the public more often than many other kinds of employees. A statewide campaign to encourage teachers to protest the legislature’s actions, called “Decline 2 Sign,” resulted in many local school districts passing resolutions indicating their disapproval of lawmakers’ mandate forcing teachers to give up their constitutionally protected employment protections. Two school districts, Guilford and Durham counties, as well as the North Carolina Association of Educators (NCAE) filed separate lawsuits challenging the repeal of tenure and the lack of guidance surrounding how to award temporary contracts that offer a little more stability to the best teachers. Those lawsuits recently got big wins in court. Guilford and Durham counties were let off the hook for having to award the 25 percent contracts, and Superior Court Judge Robert H. Hobgood declared the legislature’s repeal of tenure and their 25 percent contract system each as unconstitutional, effectively letting the entire state off the hook for awarding the contracts and allowing teachers who are currently tenured to keep their employment protections. Berger’s education plan, said NCAE attorney Ann McColl, is clearly a reaction to what has happened in the courts. Is it legal to force teachers to give up career status in order to gain any increase in compensation after years of frozen pay? 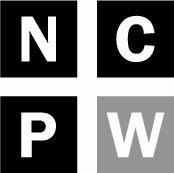 “Making people choose between reasonable job protections and reasonable salary is something we’ll be investigating,” said NCAE’s McColl. Senator Berger offered few details about how he’d pay for the proposal Wednesday, but promised the $468 million plan was fully funded with recurring funds in the Senate’s budget. 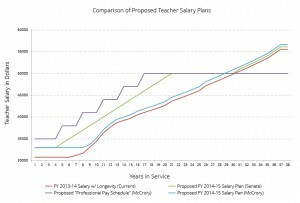 With the state facing a $445 million revenue shortfall this fiscal year and another projected $191 million shortfall next year, along with high Medicaid costs and a tax plan that creates structural deficits for years to come, speculation ran high as to where deep cuts would come for such an expensive plan to boost teacher pay. Details emerged late last night that indicated funding for teacher assistants, which has dropped off sharply in the past few years, would be hit again. Funding for TAs would be cut nearly in half by $233 million. The state’s Department of Public Instruction’s budget would suffer a 30 percent cut. Perhaps the biggest loser would be the Department of Justice, run by state attorney general and democratic gubernatorial hopeful Roy Cooper. Half of his budget will be gone, with some positions and departments moving elsewhere, and others eliminated. Grimsley High School English teacher Michael Albert says he feels offended by Senator Berger’s plan to strip teachers of tenure in exchange for pay raises. But, says Albert, he plans to accept the pay raise if it becomes law. “I’ll take it next year, but I’ll also start looking for a job in another state,” said Albert.